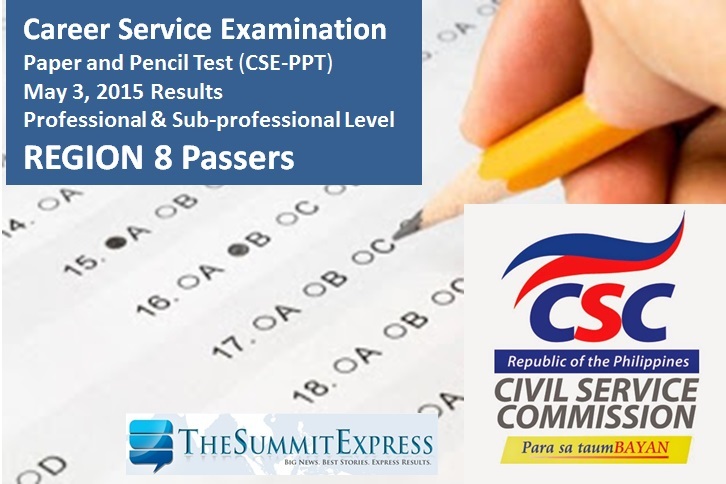 MANILA, Philippines - The official results of May 2015 Civil Service Exam - Paper and Pencil Test (CSE-PPT) are finally out online today. The Civil Service Commission(CSC) has released the list of passers per region for the Professional and Sub-Professional Examinations. Examinees of the May 3, 2015 career service exam in Region 8 (Eastern Visayas) may now check results on this webpage. More than 180,000 examinees took the Civil Service Examinations in 52 test locations nationwide, according to CSC. The CSC named a total of 487 passers for Professional level and 72 for the sub-professional level.